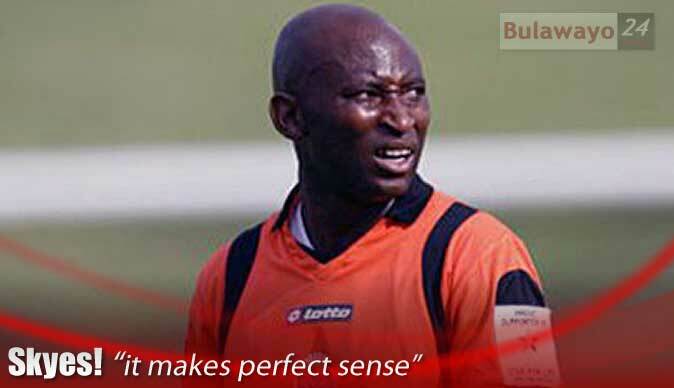 Peter Ndlovu calls off deal with Dynamos! "One of the key things that Peter's camp wanted to be guaranteed was that their discussions would be kept a secret and neither his camp, nor Dynamos officials, were to reveal anything about the deal until after both parties had reached an agreement and a deal had been signed"
The Flying Elephant, who turns 37 on February 25, has been in the eye of a media blitz since it was revealed last Saturday that he was on course for a sensational return to the domestic scene, in the blue and white colours of the Glamour Boys, exactly 20 years after he left for the greener pastures of English football. Ndlovu's decision to keep his silence, in the wake of DeMbare's declaration that they were making a move for him and that the negotiations had gone so well that they had even reserved a place for the forward on their Champions League squad for this year, had also helped trigger a frenzy of media speculation. But the reporters can reveal today that Ndlovu's intended move to DeMbare has collapsed and the most successful captain to lead the Warriors will certainly not feature in the Glamour Boys' team during both their domestic and Champions League campaign this year. Impeccable sources told this newspaper yesterday that Ndlovu and his management team have cancelled his proposed move to DeMbare because of concerns over the way the club's officials had breached a major condition of the negotiations that had been taking place between the two parties. The breaking point, we can reveal today, was centred on the decision by the Dynamos officials to go ahead and announce their move for Ndlovu when both parties had agreed that the matter should be kept under wraps until all the negotiations had been concluded. Dynamos chairman Farai Munetsi told The reporters on Friday night that they were in the process of tying the blockbuster deal to bring Ndlovu out of retirement and confirmed that they needed the former Warriors' skipper to bring his experience to a squad that is clearly lightweight in attack. "We are really desperate for strikers and it appears we just do not have enough strikers in the country at the moment," said Munetsi. "So we have left slots that we would want to fill with strikers and Peter is coming in on Monday so that we can finalise the deal and have him in our squad. "We hope his experience can rub onto the youngsters that we have in the team. His profile in our football is also undoubted and it is like bringing David Beckham on board where apart from the football, you would also have scored from a commercial perspective. What was supposed to be the beginning of a high-profile marriage, with the negotiations having spilled into the public domain, sadly marked the start of the end of a proposed relationship that had touched the hearts of thousands of Dynamos fans ready to embrace the arrival of King Peter. The decision by the Dynamos leadership to go public with the negotiations that were taking place between the club and the Ndlovu camp, said the sources, was a violation of the agreement that both sides had struck - which would be the foundation of their talks - to keep everything under the blanket until a deal had been signed. "Peter's proposed move to Dynamos is off," said the sources. "Yes, there were talks that had been going on and there was a commitment that had been undertaken to bring Peter out of retirement to play one final season here in Zimbabwe. "The one issue that had really swayed Peter into the Dynamos corner was the fact that the club was playing in the Champions League and Peter has always carried this status as a man who has always served his country well when it comes to football. "So the plan was to make Peter play for Dynamos, and the Champions League assignment fitted very well to his role as a national football ambassador, and it was felt that it was the best possible way for him to say goodbye to all the fans who have supported him. "While Peter grew up in the Highlanders' camp, there is no doubt that his profile grew and with time, as he captained the Warriors, he became a man who represented Zimbabwean football and who was not only accepted but supported by everyone in the country. "So the idea of him playing for his country again, of course in a different role now in the Champions League, appealed to his management team and that is the reason why the doors were opened and there were formal discussions with the Dynamos executive. "But one of the key things that Peter's camp wanted to be guaranteed was that their discussions would be kept a secret and neither his camp, nor Dynamos officials, were to reveal anything about the deal until after both parties had reached an agreement and a deal had been signed. "Unfortunately at the weekend things didn't go according to plan and it's now a fact that the Dynamos officials went ahead and made the discussions public, which was a breach of the founding agreement between the two parties which had enabled them to discuss the possibility of a marriage, and it spelt the end of the road." There were serious concerns within the Ndlovu camp, revealed the sources, that if the Glamour Boys officials could breach agreements, so early in their proposed partnership, what then was the guarantee that the same leadership could be trusted to honour all their obligations in the marriage. "Basically there was a snowball effect to the whole issue because there was a feeling, within the management team guiding Peter right now, that if the Dynamos leadership could not be trusted to just keep their word on secrecy, so early in their proposed marriage, then what guarantee was there that they could be trusted to honour other things in the future," said the sources. "It's all about professionalism and the respect for all the parties in the negotiations and there was a feeling that the Dynamos leaders had betrayed their counterparts. "Peter Ndlovu is a brand and it needs careful management in terms of what is released to the media, regarding his moves, and when such information is released and there was a reason why his camp wanted to first have the deal signed before it could be made public. "So at the weekend there was a feeling of betrayal in his camp after news spread all over the world that Peter was on his way to Dynamos and that was the moment it was decided that the negotiations were off and Peter, as much as he would have wanted to serve his country playing in the Champions League, would not be moving to DeMbare." Ndlovu, who at the peak of his powers in the '90s was hailed by the English media to be as good as legendary Irish forward George Best, exploded on the domestic scene exactly 21 years ago - as a 17-year-old schoolboy - playing for a Highlanders team that won the championship that season. The teenage star was so good that year, and made such a lasting impact with his skills, that football writers - during their years of innocence when their choice for the best football player was influenced by substance rather than foolish regional links - duly voted him the Soccer Star of the Year. The following year he won the award again, becoming first player since independence to retain the award and only the second player in history after the legendary George Shaya to do so, after another starring role for Highlanders. That marked the end of Peter's short flirtation with domestic football and, at the age of 18, he was airlifted to Coventry City where he starred in the English Premiership. Last year after a football adventure that took him to Europe and South Africa, Peter Ndlovu returned home and settled in his hometown, the City of Kings, and he revealed that he still fancied one final fling with the domestic Premiership before leaving the playing field for good. The good money was on him going back to Highlanders but last week Dynamos sprang a surprise when they announced that he was on the verge of securing his signature. However, the deal has since collapsed and sources indicated yesterday that Peter was likely to stick to his retirement which he has used to get some coaching badges and help his passion to develop emerging talent.